And I want to say thank you to Lisa! 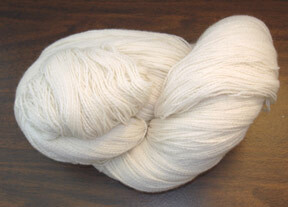 She sent me this lovely lace weight from Joslyn's Fiber Farm. I think it might be Spider's Web? I didn't have an email address or url for you Lisa, but thank you!! Now what to make with it? It's lovely and soft and there appears to be a lot of it. (2500 yrds if it is Spider's Web!) I guess it's time to pull out my favorite lace book -- A Gathering of Lace . Lots of new sites added to the ring! 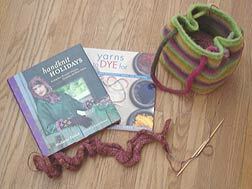 I just added lots of new sites to the Knitting Blogs Web Ring. Go check them out! I just reviewed Pelle's New Suit by Elsa Beskow over at Two Friends Collect Books. Great holiday gift for the child or grandchild of a fiber fanatic! And last night I finished Disgrace by J. M. Coetzee. I would review it, but I'm still digesting it. So dense, yet sparse. While you read about the mundane events of daily life, you are also getting so much more -- a feeling of the weight of history for those in South Africa. Now this is writing. When we moved into our old house last year, there was a big, heavy thing attached to the master bedroom fireplace. We didn't know what it was really, so Pete sent in a picture to the Chicago Antiques Guide. Today they featured it! You can see the article, including a picture of what turned out to be a gas heater, here. "Fondly, Charlie Trotter" or my husband went to a seminar and all I got. . .
was this super cool cookbook! No, it wasn't even a cooking seminar. 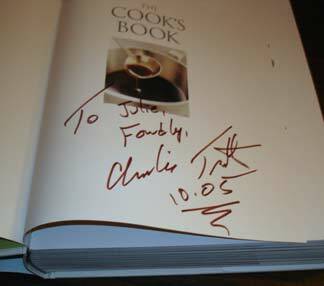 It was a business seminar (he's a credit manager for a big Chicago based real estate company), but Charlie Trotter was there giving away and signing cookbooks. How cool is that? Update. . . I had a chance to look through this cook book last night and it is *excellent*! It has pictures of everything and explains how to cook and prepare pretty much any food. It's called The Cook's Book and I would highly recommend it to anyone interested in cooking or becoming a better cook! Wendy's Book is up at Amazon! New online knitting mag -- MenKnit Magazine. And Theresa has up a new book review! Still going quite well. 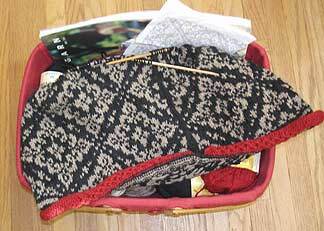 . . still enjoying the knitting and the pattern. . . but I am having a bit of start-itis. I need strength to persevere! And in back-tack news. . .
Time is running out! So yesterday I sat down an focused on sewing. 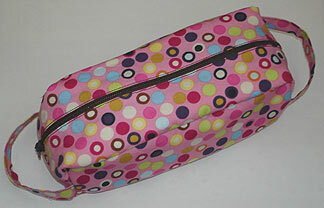 The fabric I used is a thick cotton -- like an upholstery fabric -- so the bag has a nice feeling of substance. And inside. . . 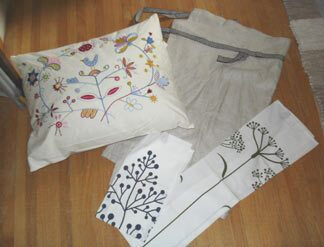 There are some pockets for "stuff" (which will not be shown here just in case my back-tack match reads my blog!) Notice the bias binding on the top edge of the pockets -- I have kind of solved my bias binding problem. I purchased a bias binding foot for my Pfaff (I *heart* Pfaff!) It only works for little bindings (you start with 1 in. strips of fabric), but it is really amazing. I'll have to do a tutorial on it sometime so that you can witness the magic -- because it really is like magic! And before I cleaned up, I grabbed some scraps. . .
Maddie and I had a great time at IKEA today. We started with lunch -- swedish meatballs for me and mac & cheese for her. Then it was time to shop. 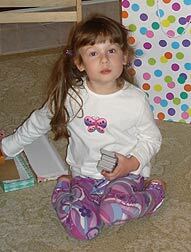 Maddie had to sit on everything, check out every bed and visit every playhouse. She wore me out! But then I got to drop her off at the kids play place -- one hour of child free shopping. How cool is that? You can see that I got a nifty apron (a little wrinkly in the picture I'm afraid) that is complete with loops for your dishtowel and utensils. I couldn't resist the pillow -- it matches my cute lamp from this post. And what about those dishtowels -- aren't they great? One or both might become an apron. I also bought 24 plates -- real ones! -- for only 50 cents each. I can't stand throwing out all the plastic plates whenever we have a party and now I don't have too. Other things were purchased of course -- a couple small pillow forms, some lingonberries and swedish pancake mix, dishes for Maddie just like the kids' ones they use in the IKEA restaurant, etc. . . I'm so happy the IKEA is close by and I'm sure Maddie and I will both be visiting there often! I'm off to the new IKEA! Pictures of purchases when I return! Not much time for reading. . . 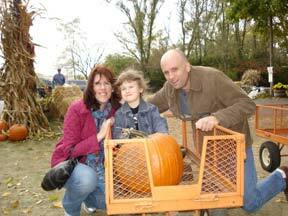 I have been rather busy lately -- especially since school started (I homeschool). But I have found a little time to read here and there. I recently finished both Eragon and Ireland: A Novel . Both good books. Now I am starting this book. . .
Alan Hollinghurst's The Line of Beauty . This won the 2004 Man Booker Prize, which is a good sign as far as I'm concerned. Other Man Booker winners that I have enjoyed include Yann Martel's Life of Pi and Ian McEwan's Amsterdam . And in Knitting Blogs Web Ring news, I've shut the ring down to new members until after the first of the year. Just too much going on with the holidays approaching! Pete just informed me that the winner of the Man Booker 2005 Prize for Fiction was just announced yesterday! The winner is. . . .
John Banville's The Sea . So here I am, deciding that I must finish Ingeborg before the holidays. How to stay on track? Commit to weekly progress photos on the blog. Think it will work? I've finished one pattern repeat. 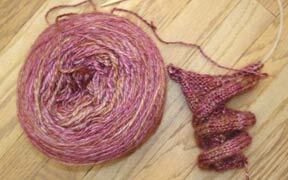 (I think it may be about 4 pattern repeats from the bottom to the shoulder.) This close-up shows how my technique is progressing. I use a two handed method and it's going pretty quickly. And as you can probably see, my tension has improved quite a bit. There was no way that I was going to rip this out due to some tension issues. This is my first Dale stranded sweater and I'm viewing it entirely as a learning experience. Besides, I figure a good blocking will even out that bit of wobbliness at the start. In other news. . . Theresa and I went to The Fold in Marengo, IL for a spinning lesson. Toni, who owns the shop, is incredible, generous and very knowledgeable!! She got Theresa's wheel up and running in no time and fixed mine up too. If you are going to Rhinebeck, make sure you stop by and see her! Interweave Knits has a new special issue coming out any day called Knitscene. 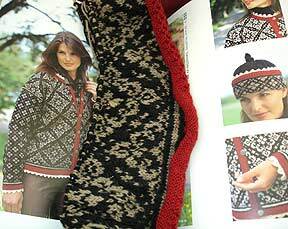 It looks to be aimed at younger knitters and has some great looking designs which you can see in the online preview. I don't have a copy of the mag yet, but I can already tell from the website that this is 100 times better, in my opinion, than Knit 1. What do you think? The picture from a few posts ago? It was Ingeborg. I'm really determined to finish it this time. 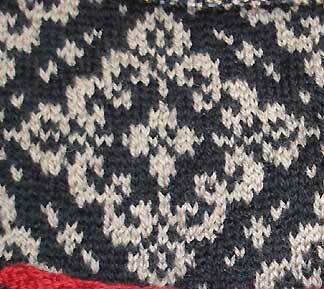 Since this is my first fair isle (stranded?) sweater, I'm kind of nervous about tension issues. However, I'm pressing on and doing at least 2 rows a day. I'll post pictures about once a week to keep me honest. I felt so domestic yesterday! As we sat and drank our coffee and ate our donuts, we watched the Food Network. Rachael Ray was making mac & cheese from scratch and I got it in my head to do the same. Now when I want to cook or bake something I usually scour my vast cookbook collection, search the internet and then come up with a hybrid recipe. However, yesterday I found a recipe that needed little change -- Fannie Farmer's Classic Baked Macaroni & Cheese. I switched out whole milk for the milk & cream and I omitted the breadcrumbs because I felt lazy. The mac & cheese got a thumbs up from the whole family. (How could it not -- did you see the nutrition info -- yikes!!) The only change I would make is to use a very sharp cheddar next time. Is that cool, or what? My zippers have never before looked this good! 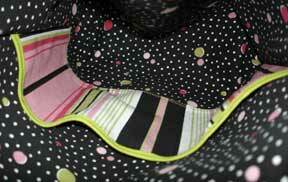 The pouch is fully lined and I even used bias binding to cover the seems inside. Bias binding is my nemesis and I still can't get it to look as perfect as I would like. I'm winning the battle of the zipper though, so I do have some hope that bias tape will eventually yield to my will! Can anyone recommend some good basic sewing books? The September Issue of MagKnits is up!! Did you see this new knitting magazine? They have a free Sample Issue available online. Check it out!